I’ve always been a fan of the original Iron Chef from Japan, and the newer Iron Chef America. I like all of the Iron Chef America chefs except for Kat Kora. She’s like Iron Chef Italy from the original Iron Chef, no one wanted to challenge him. But my favorite by far is Iron Chef Masahara Morimoto. Morimoto owns a restaurant in NYC appropriately called, “Morimoto” that is all the rave. 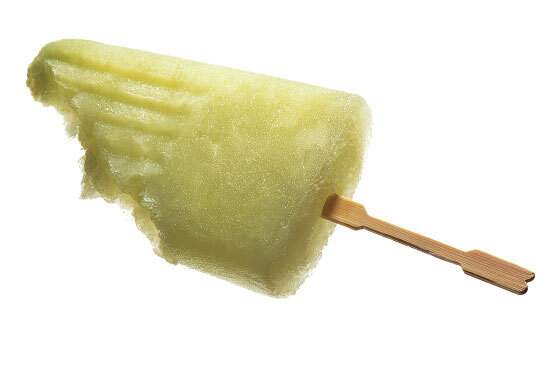 Among his culinary delicacys, he serves this sinus clearing Wasabi popsicle. Would I try it? Probably not. Wasabi and sugar just doesn’t sit well with me. But if Morimoto serves it, I know it will be bought. I honestly cant even imagine how this tastes.